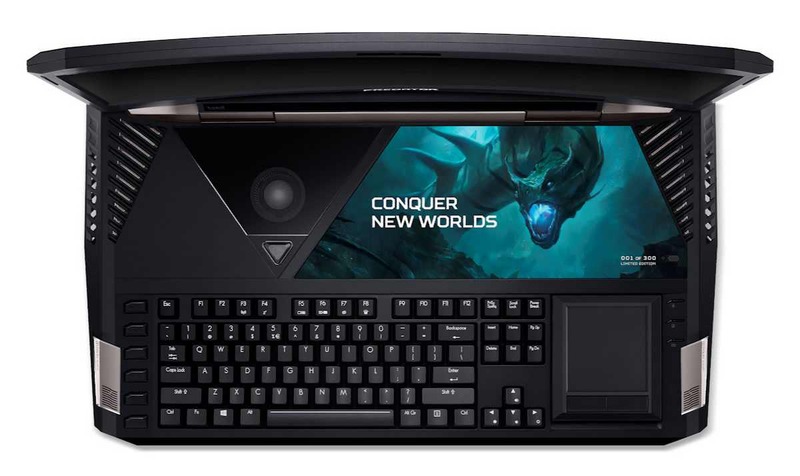 Acer today announced Acer Predator 21 X monster gaming laptop. Previously, Acer unveiled it at IFA 2016 in August. Now the company has announced full specs, pricing, and availability of the device. Acer Predator 21 X is a monster which is powered by 7th Generation Intel Core i7-7820HK processor and two NVIDIA GeForce GTX 1080 GPUs. The laptop also includes up to 64GB of RAM and 4 TB of SSD storage. Acer also features Tobii eye-tracking technology and a mechanical keyboard built into the laptop. Above all, this laptop has a curved 21-inch display (a 2560×1080 IPS display). The laptop has five cooling fans to keep the device cool. Cooling is achieved via an advanced cooling architecture consisting of five system fans and nine heat pipes. It also includes Acer DustDefender, which removes dust build-up and improves heat dissipation, and Acer’s CoolBoost app, that can be used to adjust the fans’ airflow to deliver extra cooling performance during heavy use. Curved 21-inch IPS display (2560 x 1080 resolution with a 120Hz refresh rate), with NVIDIA® G-SYNC™ technology. Features the latest 7th Generation Intel® Core™ i7-7820HK processor. Dual NVIDIA GeForce GTX 1080 GPUs in SLI for unmatched graphics performance. Up to four 512GB solid state drives in RAID 0 configuration (including 2 NVMe PCIe SSDs, which are up to 5x faster than SATA SSDs). A 7200 RPM hard drive with up to a 2TB capacity. Advanced cooling architecture with 5 system fans, 3 of which are ultra-thinAeroBlade metal fans, to extract excess heat for uninterrupted performance during intense sessions. The Predator 21 X’s numeric keypad also touts a unique design as it can be flipped over and turned into a Precision trackpad. The Predator 21 X will be available in February with U.S. prices starting at $8,999.